Oktopod: Dev Kit for Your Robo-ideas! Home Oktopod: Dev Kit for Your Robo-ideas! 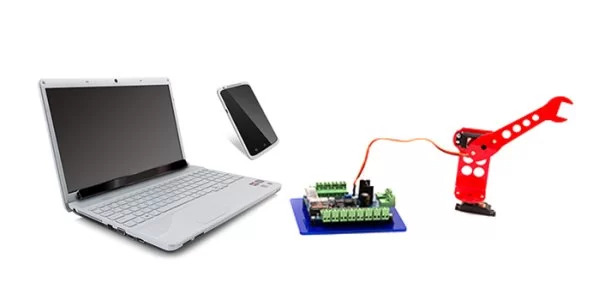 Oktopod Studio is a development platform for mechatronics, robotics and automation, which enables creating and controlling low voltage electronic devices, models and home applications /in an extremely simple way/. Oktopod Studio enables students to meet the practical problems of a technical nature and to solve them. If students through simple technical systems understand the working principle of the sensor, LED lighting, actuators (motors), later they will be clear and principle of operation of complex technical systems. Here’s the core of the Oktopod Studio, which introduces students to the world of Robotics and Mechatronics. Oktopod_Board presents a Programmable Logic Controller (PLC), which features plug and play inputs and outputs for connecting low voltage electronic devices, like: LED lights, DC & servo motors, electromagnets, switches, photo, temperature and magnetic sensors, and so on. Oktopod_Control is an application for computers and mobile phones, which allows manual control and programming the board (currently for Windows and Android). Manual mode: – the software can be used as a wireless remote control for the board, like a virtual dashboard! In this case the desired actions are executed in real time, by moving the sliders and pressing the buttons. For more detail: Oktopod: Dev Kit for Your Robo-ideas!